Almost all the astrologers believe that lagna counts for two-third of importance while predictions are made and moon sign accounts for one third. Let us see how lagna is important and lagnesh more vital than a yogakaraka planet. To understand the real meaning of lagna we have to understand the zodiac first. The first sign of the zodiac, Aries represents the first stage in the evolution of man and his place in the universe. This truth is evident by exalted position of sun in Aries which means in first house of kaalpurusha horoscope. This position of sun allows the identity of soul to shine and assume power and confidence with full control of self. So the point is that ascendant is considered as pivotal point in a horoscope according to concept of purushatattwa or energy centre representing the vital force of life. There is nothing possible in this universe with solely ISHWARAMSA i.e. purushatattwa or male element. At the advent of creation of universe god himself created everything with male and female elements combined in it. That means the great lord’s (ishwar) shakthi became ardhanaarishwara and created the whole srishti. If we go into antiquity of ardhanaarishwara concept, there is reference in PURANAS, that brahma when asked rudra to divide himself for creation of srishti the rudra then divided himself into male and female form.BRIHAD ARANYAKA Upanishad states that original purusha [soul] was one then the original purusha divided himself into male and female and the multiplied himself. Aries represents the lagna of kaalpurusha and Mars represent the raw energy necessary for individual survival, especially the desire and aggressive urges. Libra, on the other hand, is the sense of balance, harmony and co-operation necessary for the survival and maintenance of civilization and culture. Male energy is called purusha naturally denoted by Mars and so the feminine energy represented by prakriti denoted by Venus and hence their mutual interaction is important regarding marital matters. As 1st house represents the vital force and 7th house stands for dissipation of the same force. If 1st house is the physical being then obviously 7th house indicates the physical involvement with members of the opposite gender for purpose of procreation. So mars in any horoscope is most vital in matters of procreation, marital dealings and overall utilization of purushatattwa or the vital force for the upliftment of the soul through various experiences with the world. 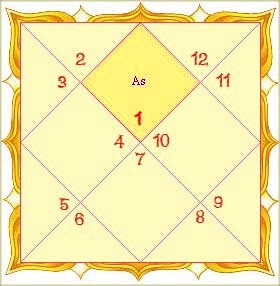 When first house is the reservoir of pranashakthi in oneself, 7th house decides the field of activity. Literally speaking quality and strength of beejam represented by lagna lord in any horoscope means the energy one has by birth and how the native is destined to make use of that energy in one way or the other. The following are important points reflecting effects of lagna through various signs, houses and dasha scheme. The mentioned parameters will always outlet the vital force of lagna through various sources to make advancement in life and to enrich the soul and give life changing experiences. As lagna is both Kendra and a kona house so lagna lord always acts as yogakaaraka planet and gives very meaningful developments in native’s life. Planet placed in lagna always holds some vital happening of native’s life through the houses of lordship of that planet residing in lagna. The depositor or lord of that sign where lagnesha is placed holds the key to a life shaping time period in its dasha. The nakshatra holding lagna /lagnalord is equally valuable to give effects of lagna to shape one’s destiny. That nakshatra lord’s dasha is considered for essential developments of life. The navamsa lord of lagna (d-9 lagna lord) and navamsa lord of lagnesh (sign where lagnesh is placed in d-9) hold value to give vital changes in one’s life. Hence, the quality and strength of lagnesha as per shadbala, retrogression/direct motion, interaction with other planets and other planetary connectivity with lagna in D-1 & D-9 hold key to life shaping experiences to the native.